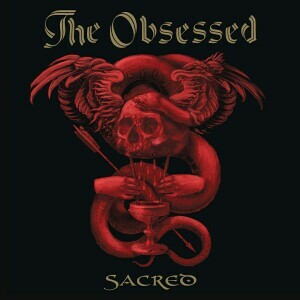 Scott “Wino” Weinrich is back with the Doom/Stoner Rock innovators The Obsessed, to finally record a follow-up to 1994’s release ‘The Church Within’! Many know of Wino from his early days with Saint Vitus and more recent years fronting Spirit Caravan. In reforming The Obsessed, Wino has maintained lead vocal duties in a 4-piece studio band, and a stripped down power trio unit for live performances. Engineer Frank Marchand has done an amazing job bringing an expansive, very live sound to the 14 tracks on this new CD project titled ‘Sacred’. The guitar sound is so immense it almost assumes a physical manifestation, and the chords hit like a head-on collision: concussive, dense, and impenetrable. Drummer Brian Costantino’s tempo is relentless and unforgiving, driving with jackhammer speed at times, evident on the more proto-punk stylings of “Haywire” and “Punk Crusher”. While Wino is one of the key figureheads of the Doom Metal/Stoner Rock subgenres, this collection of songs does not fall in to a stereotypical trap, and does not rest on the laurels of a singular compositional mindset. As examples, the instrumental “Cold Blood” riffs a heavy groove for a full 3 minutes before firing up the lead guitar soloing. “Stranger Things” has a complex rhythm; verging on an intellectual prog rock format, and “On So Long” stretches out like an epic 70s-era slowburn hard rock jam. Speaking of the 70s decade, Wino and company present two cover songs in this set. Thin Lizzy’s “It’s Only Money” and Mountain’s “Crossroader”, which help to complete the rungs of the ladder that bridge those influences that inspired Saint Vitus, with the 21st century vision of this current line-up of The Obsessed. I recommend ‘Sacred’ quite highly, and not necessarily just for the resident metal-head in your household.